Who Won The Viet Nam War? Total VC failure in all SVN - 32,000 KIA; 5,800 POW. eg - after TET 68, no more terrorist attacks or sabotage in Saigon. Combat markedly reduced - accent on defence - "Vietnamisation"
US continues withdrawal of elite units - 25,000 gone by end Aug, another 45,000 gone by end of year - replaces with Army units mostly defending SVNs 800Km border with Laos & Cambodia. Most fighting now on border or in Laos & Cambodia - Fish Hook, Parrots Beak, The City, Rock Island East - major supply captures. Feb - SVN incursion deep into Laos. Very successful at first, but over-extended. NVA counter attack with two Armoured Divisions (36,000 men, Soviet tanks & artillery). SVN force withdraws. March - NVN reneges on 1968 Johnson agreement - puts 45,000 troops across DMZ supported by Soviet tanks and artillery. Trusting the agreement, SVN has 9000 raw troops (US had 80,000 before the agreement!). The SVN force is routed. April - NVN puts a further three Divisions across the Laos and Cambodia borders. Success, but with heavy casualties. By now, the US has withdrawn all but 70,000 of its combat forces. April - Nixon orders bombing of NVN, including mining Haiphong harbour against Soviet resupply ships. SVN counter attacks: stops invasion. US fire support but no troops. SVN retakes NVN gains, but many casualties. Soviet Pres Podgorny & China's Chairman Mao advise Hanoi to negotiate and sign the Peace Accords. Peace Talks proceeding (slowly). US continues withdrawing on basis that war is won and that even Soviets & China are advising Hanoi to sign. However, Hanoi stalls talks. US stops bombing as a sign of good will. Hanoi refuses to sign, using POWs as a bargaining tool. NVA regrouping retraining, re-equipping, preparing to invade. April - NVA approaching Saigon - "winning the war". remaining Americans and 5595 South Vietnamese from Saigon. April 30 - Soviet tanks crash through the gate. Khe Sanh is frequently painted as an American failure to learn the lessons of Dien Bien Phu. The Americans are claimed to have established a large base in a valley overlooked by hills, which the VC then occupied and directed fire from. A small VC force was then able to "pin down" a large US force for many weeks, pouring Artillery fire into the base with few casualties to their own forces. This assessment is totally wrong. The US forces occupied all the overlooking hills with just a Company on each hill. The "VC" forces were in fact the two very best NVA Divisions available. The US forces peaked at three Battalions - less than one third of the NVA forces. For every 1 NVA round incoming, there were more than 10 rounds fired outgoing. Far from "pinning down" the US forces in a battle of artillery attrition, the NVA constantly attempted to assault the various US perimeters. Over several days, they never penetrated the perimeter. The NVA were only able to bring artillery fire to bear by using large-calibre Soviet artillery based in Laos, where US artillery and air support could not fire suppression missions. Hue is frequently painted as a demonstration that the VC could have occupied and defended territory if they wanted to. It is held that the civil population welcomed the VC forces as liberators and helped to defend them when they came under attack. The fact that they held the Citadel for so long is supposed to prove the ineffectiveness of the US forces. This assessment is also totally wrong. Prior to the main attacks, the local VC forces made diversionary attacks only. The main assaults and occupying forces were all NVA units. Hue was the third largest city in SVN. It was essentially two cities in one, divided by the Perfume River and connected by the Nguyen Huoang Bridge. On the North side of the river was the three-square-kilometre "Citadel" - a fortress defended by massive walls and deep moats - which was itself the seat of the Provincial government and had deep historic and cultural significance to SVN. There was just one Company of combat troops in the city itself. After the city and Citadel were safe, the local population reported that the local VC had massacred large numbers of the city's residents. 2810 bodies were subsequently found in a number of mass graves, and a further 1946 remained unaccounted for. To the NVA Commander's credit, he stopped the VC massacre when he found out about it. Communist actions at Hue leave little to be proud about. This was the name given to the Communist Psy-Ops, aimed at the civilians at home. As in most Psy-Ops, it was based on distortions, highlighting of isolated or extreme incidents, twisting of facts, omissions and outright lies. Use of "VC" instead of "NVA"
For most of the war, NVN denied having troops in SVN. Using "VC" made it sound like a civil war. Stressing the inevitability of communist victory and therefore the uselessness of western resistance. Driving a wedge between the soldiers and their support base back home. Therefore making the Allies & SVN aggressors, mercenaries, undemocratic, manipulated and victims of their politicians. The war is domestic - it's a civil war. Therefore outside intervention is illegal, immoral, illegitimate and thus inexcusable. Communist forces attacked infrastructure and civil targets at will in SVN & indulged in widespread terrorism of SVN population. Allies only attacked military targets until late in the war, and then only limited attacks on selected civil targets right at the end. Open Western press discussed failures and options - in fact, came to stress failures. Allied policy was NOT to use all the power at their disposal in order not to over-react. NVN was on a total war footing, including full conscription and total dedication of resources. Allies were never on a total war footing - in fact, were never even near creating a war psychology at home. The "fact" that the small, weak, isolated but dedicated VC prevailed over the giant American bully. In fact, at the infantry level, man-for-man, the Allies were outgunned. Soviet & China support throughout the war. In Nth of SVN, NVA used Soviet Artillery of greater range than Allies. Soviet "trawlers" off Guam tracked B52s and forewarned Hanoi of raids. Soviets installed and ran a sophisticated SAM air defence system in NVN. Soviets ran the air war at first, using advanced MiG 19s and MiG 21s. Almost invariably advanced mines or grenades rigged with trigger devices - these were not normally home-made devices assembled from unexploded bombs etc. These were only used by the lowest part-time VC troops, couriers etc. The "fact" that the war with the Allies was just a re-run for the Communist forces of the previously successful war against the French. All we ever hear about the French Indo-China War is the Viet Minh victory at Dien Bien Phu. We never hear about French victories at Vin-Yen, Mao Khe and Minh-Binh. Viet Minh losses in these three battles alone exceeded 9000 KIA. Which force killed civilians as a matter of routine? The Allies were signatories to the Geneva Convention and generally complied with its rulings. There were presumably breaches, but, despite many allegations, few examples have been documented. On the other hand, NVN was not a signatory and did not apply the Conventions. POWs were routinely paraded to the civilians, filmed, interviewed and, in many documented cases, tortured, both physically and psychologically. 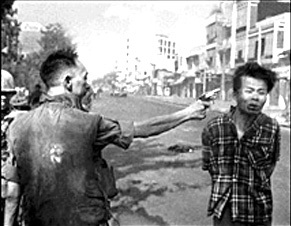 While discussing POWs, we should look at the famous (or infamous) photograph of SVN General Loan executing a VC POW. The usual explanation tells us that the high ranking SVN officer took a VC prisoner out into the street and shot him in the head in front of the photographers and journalists to show other VC what awaited them if captured. General Loan was, in fact, the Chief of the National Police - he was not acting in an Army capacity but in a Police capacity. Loan was the target of a VC unit sent in to Saigon to assassinate him. The VC unit failed to locate Loan on the day, but broke instead into the home of one of his best friends, a Colonel in the National Police. The VC unit then murdered the Colonel, his wife and their six young children, some of who were godchildren to Loan. SVN Marines discovered and engaged the unit and all but one of the VC were killed. The remaining one was found to be carrying a pistol, indicating he was the leader. He was taken directly to Loan. The VC was in civilian clothes on a terrorist mission in a city under Police, not Army, jurisdiction. When told of the circumstances of the capture, Loan summarily executed him. The National Chief of Police acted within his powers in the summary execution. On the contrary, body-count ensured that only confirmed killed were included. It ensured that "I think I hit him" estimates were omitted. The VC and NVA forces did whatever they could to hide bodies, including routinely burying bodies one beneath another in single graves. By the end of the war, Allied estimates of VC and NVA body-count totalled about 500,000 KIA. In 1995, Giap admitted to a figure of 1.1million communist soldiers killed in the war. The Allied body-count of communist killed was almost always underestimated. On the other hand, communist estimates of Allied killed and other casualties were almost always grossly overestimated. 6RAR was wiped out twice in its first tour alone! The "fact" that the war was really a civil war that foreigners should not have interfered. The obvious conclusion is that the heaviest casualties were where the NVA units routinely operated. This being the case, it is equally obvious that the War was NOT a civil war confined to South Viet Nam. The "fact" that the wily VC chose to go underground to deceive the Allies. The tunnel systems were originally constructed for temporary hides, storage, safe routes between points and for refuge against bombardment - not for permanent living. As the war continued after Tet 1968, the VC and even the NVA units found it increasingly more difficult to hide from the Allied aerial surveillance and bombardment. They sought refuge from the constant pressure by living more and more underground until they were forced to develop full time living accommodation below ground, believing that the Allies would not follow them. Tunnel living was, in fact, the last VC hope of survival towards wars end. Once the tunnel systems were found, the American and Australian "Tunnel Rats" took the war to them. The "fact" that the uncivilised Americans targeted civilians in NVN with B52 strikes. First, there were many more B52 strikes over SVN that there were over NVN. B52 sorties over NVN were mostly in the early 70's, to convince Hanoi to sign the Peace Accord, so they were directed at military and infrastructure targets. There was no benefit to this activity in bombing civil centres other than where Hanoi had deliberately placed sites of military importance within residential areas - a tactic frequently used by Hanoi. US bombing was at all times used or withheld based upon Hanoi's keeping to its agreements or breaking them. To stop the bombing, Hanoi had only to honour its own promises. The "fact" that the longer the war took, the better the VC were by virtue of the fact that they gained experience and wore down the Allies. Before Tet 1968, POW statistics revealed that almost all of the VC and NVA POW had more than 6 months of training before entering a unit and fighting in SVN. After Tet 1968, NVN rushed 80,000 to 90,000 troops down the Ho Chi Minh trail to replace losses and the statistics showed a dramatic change. By the end of 1968, less than 40% of the new POWs had 6 months of training and 50% had 3 months or less. This included the time spent travelling from NVN. Aided by journalists with their own agenda and by misled academics, the West has generally accepted the "Dich Van" allegations made by NVN during and since the war. The facts to support an Allied victory in 1973 are ignored and the duplicity of the Communists in breaking their agreements (not once but several times) is excused in the rush to accord them the honours of victory. The Communist "win" was accepted by the international community who then recognised that the only alternative was to entirely eliminate NVN (and possibly even their supporters) by a Nuclear War, and this was not acceptable to the West.